As you know, Thanksgiving is just around the corner. It’s that time of year where people justify overeating and wearing their stretchy pants to family Thanksgiving. But you, YOU have been trying SO HARD all year to maintain a healthy lifestyle with a big part of that being a healthy diet. Well we are here to help! 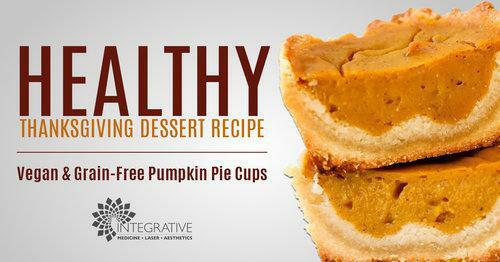 Bring your own dessert this year that is a healthier option for you and your family. Take THAT Aunt June! 1. Mix together the crust ingredients with a fork until well combined. It should be crumbly but stick together when pressed. 2. Spray your muffin pan with oil and place a strip of parchment paper in each for easy removal. Or line with paper liners. 3. Press the crust into the muffin tins, covering the bottom and sides evenly. Wetting your fingers can help if it is too sticky. You should have enough crust for 4 pie cups. Set aside. 5. Blend the filing ingredients until smooth and creamy. 6. Pour into the crusts, and smooth the tops. 7. Bake for 30 minutes at 375F. 8. Cool then chill overnight (or at least 8 hours. 9. Enjoy! Keep in the fridge.